The Democratic League of Kosovo (Albanian: Lidhja Demokratike e Kosovës, LDK) is the second largest political party in Kosovo. It is a conservative and liberal conservative party. During the late 1980s, nationalism was on the rise throughout the Socialist Federal Republic of Yugoslavia. Since 1974 the province of Kosovo, although part of the Socialist Republic of Serbia, was a self-governed entity over which the Serbian parliament had almost no factual control (see Political status of Kosovo). In the late 1980s, civil unrest which had been striking the province for decades, suddenly erupted further in Kosovo as ethnic Albanians demanded more autonomy (in view of independence). At the same time, Serbian Communists' leader Slobodan Milošević used the situation in Kosovo as a political means to win popularity among Serbs. In 1989, he abolished the autonomy of Kosovo using amendments to the Serbian Constitution, reverting Kosovo to its pre-1974 status, thus restoring Serbia's control of the province. In response, a group of Albanian intellectuals gathered the same year to form the Democratic League of Kosovo, which opposed these measures, as well as the ratification of Kosovo's parliament in 1990 which returned the level of Kosovo's autonomy to how it had been sixteen years earlier. Because of its ideology, which was deemed nationalist and separatist, it was banned by the Yugoslavian authorities, together with the self-styled shadow Kosovo Parliament that opposed the ratifications of Kosovo's real assembly in July 1990. As a result, its members proclaimed in protest on the steps of the parliament building the "Republic of Kosova", independent from Yugoslavia, which drafted its own constitution. Claiming that conditions for Albanians were not addressed, the LDK successfully called for a boycott of the Kosovar Albanians of the first free elections in 1990. Following the 1991 population census, in which LDK President Rugova also called for boycott, resulting in only 9,091 Albanians recorded which composed around 2.53% of the Kosovar population, the LDK called the Albanian people to leave and boycott all state institutions until the solution of the Albanian national question. The LDK opposed the centralized control imposed by Belgrade, which reintroduced the Serbian language as the language of Kosovo as well as making other implementations; and they were growing deeply concerned about Belgrade's handling of the Albanian populace with regards to the wider group interests. The LDK was one of the chief organizers of a poorly organized referendum for self-determination in 1992, in which 87% of Kosovo's Albanian population (numbering 80% of the province's population) voted for independence. The referendum was declared illegal and further drove a rift between Albanians and Serbians in Kosovo. 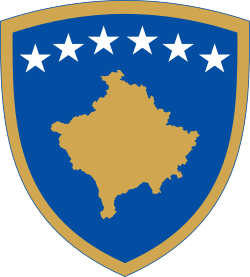 In 1992 the Federal Republic of Yugoslavia was formed and Kosovo remained an autonomous province of the Republic of Serbia. The LDK successfully called for Albanians, including those in Central Serbia and in the Preševo Valley, to boycott of general elections. The LDK expressed bitterness when Kosovo was ignored during the Dayton Accords in 1995. Supporting an Albanian resistance movement the "National Movement for the Liberation of Kosovo", it abandoned its support of the subsequently organized Kosovo Liberation Army, which used violent means to achieve its goals. After 1997, the government of Albania changed, with a first democratic cabinet formed. Most LDK members abandoned the desire to unite Kosovo with Albania at this point. The LDK's desire for a peaceful solution to the Kosovo conflict lost support among the population and was replaced by the militarist KLA when war erupted in late 1998 and 1999 between the KLA and the Yugoslavian and Serbian forces. Severe atrocities against the Albanian population in Kosovo met with harsh criticism from the LDK. With recommendations from the United States, the LDK abandoned pursuits for an independent Kosovo and sought negotiations with Belgrade with a goal of achieving a substantial level of autonomy for Kosovo, with Ibrahim Rugova traveling to Belgrade and meeting President Milošević (now federal leader) on this matter. This act was criticized by the Albanian public and further downgraded the LDK's popularity. After the NATO bombing campaign in 1999, leading LDK members were present for the signing of the Kumanovo Treaty that adopted United Nations Security Council Resolution 1244 and formalized the cessation of hostilities in Kosovo. However, despite their support of Resolution 1244, which mandates significant autonomy for Kosovo while recognizing the "sovereignty and territorial integrity" of Yugoslavia, the LDK continually supported the independence of Kosovo. While still the second largest political party in Kosovo, the LDK's support has steadily declined since Kosovo's first elections (municipal) in 2001. Other political parties, including those linked to the former Kosovo Liberation Army, such as the Democratic Party of Kosovo (PDK) and the Alliance for the Future of Kosovo (AAK), have scored much gains at LDK's expense. The party is presided by a president and five vice-presidents. The current president of the party is Isa Mustafa. The Party initially started out as an Albanian nationalist Right-Wing movement which campaigned for Kosovan independence. It was then led by Ibrahim Rugova a moderate leader who separated with the Kosovo Liberation Army faction. After the war the party remained under the conservative leadership of Rugova. The party also adopted several pro-European policies as well as moving farther to the centre of the political spectrum. However, after Rugovas death the party went through a period of turmoil with several factions vying for control over the party. However the more liberal conservative stance of Fatmir Sejdiu took over leading to Nexhat Daci and 6 other Mp`s forming the more conservative Democratic League of Dardania. After losing seats consistently under Sejdius leadership unrest within the party began to grow and before the Kosovan parliamentary election, 2010 Isa Mustafa emerged as the new leader securing more than two thirds of the votes. Mustafas leadership has seen the party return to the more hardline conservative stance, and some politicians have even come to describe the League as a social conservative party. Critics have said the party has considerably abandoned their traditional, Kosovo-Albanian nationalist policies and policies of their founder Ibrahim Rugova. Since August 2014, it has been attacked easily by Vetevendosje. Current party leader Isa Mustafa has over 70 cases submitted to the prosecutor over alleged abuse of office while serving as Prishtina mayor. Former Minister of Culture Astrit Haraqia has been accused of abusing office during 2004-2007 as well as being involved in a large scheme to sell Schengen visas with other party official Ukë Rugova. Suspected of corruption is also current MP Naser Osmani for alleged wrongdoings while in the board of Kosovo Privatisation Agency. He ran and gained a seat in the Assembly despite the accusations. Former Obiliq municipality mayor Mehmet Krasniqi is being investigated for abuse of office. ↑ "Kosovo in crisis after LDK quits government (SETimes.com)". 2010-10-18. Retrieved 2010-10-18. ↑ "Mustafa kërkon suspendimin e zyrtarëve nën hetime, jo edhe të të emëruarve politikë". dialogplus. 2 September 2015. Retrieved 7 February 2016. ↑ "Astrit Haraqija, pjesë e grupit 21 personash të Ukë Rugovës për shitje vizash". KOHAnet. KOHA. 3 December 2015. Retrieved 7 February 2016. ↑ "I dyshuari për korrupsion në listën e LDK-së për deputet". KOHAnet. KOHA. 16 May 2014. Retrieved 7 February 2016. ↑ "I akuzuari për korrupsion është Mehmet Krasniqi i LDK-së". Portali Indeksonline. 8 May 2015. Retrieved 7 February 2016.